Irish soda bread, or brown bread, is something usually baked in the oven. But one day on Twitter, Brooks at Cakewalker (gorgeous cakes and more!) told me he'd like to see a slow cooker version. Of course, that sounded like a great idea to me, so I told him I'd get right on it. Why might you want to bake your soda bread in a slow cooker? Maybe your oven is otherwise occupied. Or it's a hot day and you don't want to run your oven. Why did I want to do it? Because I just love experimenting in the kitchen! Two years ago I posted my regular Irish Brown Bread, which I love. But knowing Brooks likes a sweeter soda bread, I modified my recipe to include a higher proportion of white to whole wheat flour and more brown sugar than my usual one tablespoon. I skipped the raisins he likes, since I wasn't sure how well this would even turn out in the slow cooker. But you can add a cup of raisins (plumped in very hot water for several minutes and drained well), if you like. Another change (in the interests of "authenticity," you might say) was using soured (with vinegar) milk rather than commercial cultured buttermilk. After all, back in the day, the Irish housewives would not have had storebought cultured buttermilk but would have used soured milk. Do you ever make Irish Soda Bread? Is it part of your heritage? Or something you've adopted, as I have? * I have the Cuisinart MSC-600 6-quart multicooker slow cooker with separate nonstick cooking pot (which is oval, but I still made the loaf round because, well, it's just gotta be round!). 2 In large bowl, whisk together flours, brown sugar, salt and baking soda. With fingers, rub butter into flour mixture. Beat egg into the soured milk. 3 Make a well in center of flour mixture and pour in all but about 1/4 cup of the milk mixture. Slowly bring the flour mixture into the liquid. Stir gently to combine into a slightly sticky dough that can be formed into a rather soft ball, adding more liquid if needed. Knead lightly, right in the bowl, not more than 5 or 6 times, forming into a ball. 4 Place ball of dough in center of slow cooker. Dough should ideally be of a consistency to flatten itself just slightly to a diameter of roughly 6 inches and a height of about 2 1/2 inches. With sharp knife, cut a 1/4-inch deep "+" on top of dough (helps the bread to cook through and not have a doughy middle). 5 Set slow cooker on High and cook for about 3 1/2* hours, or until it tests done. To test: 1. stick a toothpick in the center and see if it comes out clean and 2. tap it on the bottom and see if it sounds hollow; or 3. see if it registers close to 195 degrees on an instant-read thermometer. To cool, place the loaf on a wire rack and cover it with a clean kitchen towel. Cool completely, about 2 hours, before slicing, or it may be too crumbly and not hold together well. * Added 03/15/15: One reader found that 3 1/2 hours was a little too long in her slow cooker and thought she'd check it at 3 hours next time. Help me, puppet-master!…I am under the spell of your spelling. Once again you have forced me off my oh-so-healthy dietary preferences with seductive labels. I am so weak for language! Yea verily, though I generally shun breads, the term “Irish” crosses all borders. Add to that the word “soda” and I am helpless. Irish soda… Matters not what comes next, I would try this bread if I had the patience to actually make it. Sully, no patience is required! Hence the name "quick bread," applied to all things bready that do not require yeast and time. 'Tis the bread for you, laddie! Jean, I've got an ear-to-ear smile right now. This is the coolest ever! Not only did you rise to the challenge, you nailed it with a gorgeous loaf. I love the ingredient adjustments turned back towards authenticity, merged with modern day equipment. Spot on, my friend. Cheers! Brooks, thank you so much! 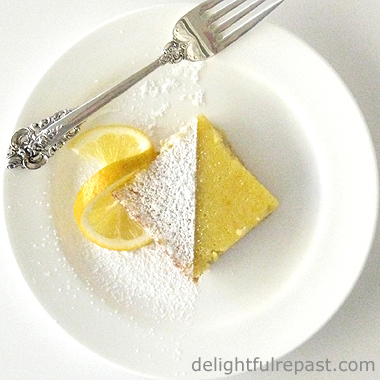 It was a fun experiment that led to a recipe I'll make again and again. I hope everyone will follow my link to your blog and check out all your fabulous cakes. I should have been mentioned your *decorating videos* (well, they'll see it here). You're most gracious, Jean. I thank you for the nod! Brooks, it is my pleasure to introduce my readers to someone who writes as beautifully as he cooks! Hello, I would have never thought of using the slow cooker to make the Irish Soda Bread. Thanks for sharing the recipe and for this post. Have a happy day! Thank you, Eileen! I hope you'll try it soon. I've never tried bread in the slow cooker before but doesn't this sound easy! Looks really good too. We love Irish soda bread here... well, bread in almost every form to be honest... but I'd not have thought to make it in the slow cooker. Since I seldom bake bread in the summer because of the heat, this is one I'll definitely try. Then again, I fall in love with all your recipes! Thanks,Maureen! Since I was late to the game getting a slow cooker, I'm trying anything at all in it! Too fun! Aaaw, Jacqueline, you're so sweet! Do let me know how it turns out for you. I've done it a few times now, and every loaf was a winner. I really can't cope with hot weather at all, so this will be a boon for summer. Kitty, I know! We seem to have a number of things in common! I hope you'll try the slow cooker method soon and let me know how it worked for you. Great idea for this time of year...have never thought about that! Thanks for the recipe and for linking to Tuesday Cuppa Tea! What a cool soda bread recipe! I would have never thought of using slow cooker to make bread. Brilliant, Jean! Ruth, thank you! I enjoy your Tuesday Cuppa Tea. Thanks, Amy! I've tried all kinds of things in the slow cooker. Works great for steamed puddings as well. Angie, thank you. As you well know, experimenting in the kitchen is soooo fun! Thanks, Greg. I'm going to be trying more breads in the slow cooker. Thanks, Jean! I love Irish soda bread! Thanks, Karen. My husband has been enjoying this one, and he's not usually a soda bread fan. I've never tried making any kind of bread. This sounds like a possibility. I'm going to try it. Wish me luck! Barbara, that's wonderful! Do let me know how it turns out for you! Nora, thank you! I can't wait to hear how it comes out. If you have any problems, let me know and we'll see what we can figure out. It's me again. We enjoyed the brown bread for breakfast this morning!Next time I think I will check on it at the three hour mark as the bottom of the bread hardened. (I have an older Cuisinart 6 quart crock pot.) Just love the smell of bread baking in the house! Thanks, Laura. It really is! Nora, thanks for letting me know. I think I'll add that bit of info to the post. Swathi, thank you! You'll have fun with a slow cooker. I'm new to it, but I'm making all kinds of crazy stuff in it! Jean, I love this recipe! I've made soda bread many times - with raisins and without - but I love the idea of being able to use the slow cooker. I'll be featuring your post at the St Patrick's Day edition of the Hearth and Soul hop later today :-) Pinned too! Thanks so much, April! Can't wait to "hop" over and check out the post! This recipe looks good alright but I don't have a slow cooker. But I did just pop your Irish brown bread recipe in the oven a few minutes ago. I've made that one last year and know how good it is! Thank you, Richard! That's so good to hear! Let me try again, since it didn't seem to work 1st time. 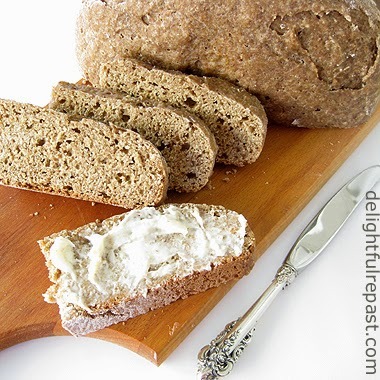 I made your recipe and Leite's Culinaria brown bread by Kevin Dundon. Yours has a lighter appearance and my taste testers assumed yours had the honey in it because it was that color. No. What yours did have was a higher ratio of white flour to WW flour. Taste testers felt yours was a preferable texture, although they liked both breads. Kevin's bread is more hearty with its half WW and half white with a handful of oats for good measure. Yours had 4 tablespoons of butter but Kevin's only had 2 teaspoons of oil, and I think it's the fat that makes the difference between chewy and cakey, although yours is not really cake-like. I have problems with dairy so both recipes were made with oatmilk soured with lemon juice to replace buttermilk and margarine instead of butter. They are both very good. I like your crockpot idea because it is like the original bastible pots that soda brad was made in. Anonymous, thank you for giving me the details about your experience with this recipe and comparing it with another. I appreciate the feedback. Jean - you did *not*! I can't believe that I had no idea that Irish Soda Bread could be made in a slow cooker! Winner! YES! I love my slow cooker. 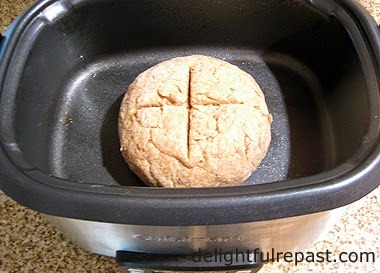 Bread in a slow cooker? Even better! Kristi, thanks! Since I got a slow cooker, I've been trying all kinds of crazy stuff in it! That's brilliant, definitely a method I haven't come across before for baking soda bread. Thanks so much, Sara! I have such fun experimenting!